Some people naturally enjoy showing off a bit, but this isn’t always a bad thing. Sometimes they just enjoy being able to share their accomplishments and feel rewarded by the positive response from others. While some people are much more modest about their success, and don’t like showing off. 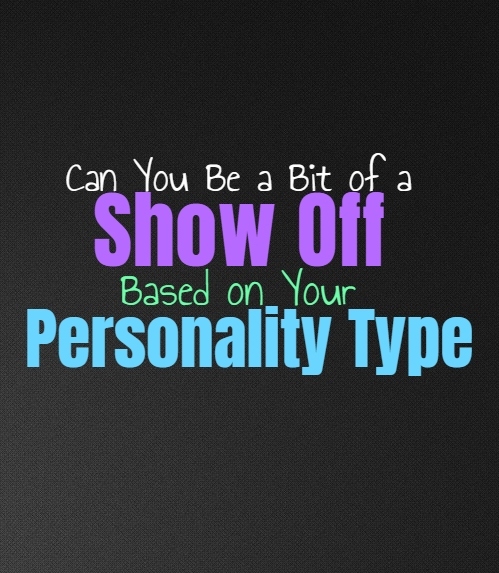 Here is how much off a show off you can be, based on your personality type. INFJs don’t like showing off to strangers, but can be a bit different when it comes to their loved ones. They are often seen as reserved and modest people, but they have many other sides to their personality. While on one hand INFJs don’t like being too over the top, they do become proud of the things they accomplish and are connected to. At times they might find themselves showing off a bit, especially when they are deeply pleased with what they have done and are capable of. ENFJs can be shows off sometimes, but only because they take pride in their accomplishments. They enjoy being able to show others what they have done, and their responses mean a lot to the ENFJ. They want their loved ones to be proud of them and to see what they are capable of. Because of this desire to please others, ENFJs do sometimes catch themselves showing off when they are excited about something they have accomplished. INFPs can sometimes be nervous about showing their accomplishments, not wanting others to stomp on them. When they are around the right people they can become show offs, but for them it is more about having someone to share these things with. INFPs enjoy being able to show off the things they are proud of and the accomplishments they are deeply connected to. When they have worked hard on something they want to be able to feel a sense of bride and accomplishment in this. ENFPs do sometimes like to show off, especially when they are truly proud of themselves. They don’t like feeling like they have to keep this to themselves and truly just want to be open about these things. When the ENFP is deeply connected to something they have done, they want to feel like they can be openly proud of this without guilt or shame. They can sometimes be show offs, but this is sometimes for the sake of humor and other times simply because they are excited. INTJs aren’t afraid of showing off when they are proud of something, and rarely do they care about offending others by this. Most of the time INTJs take personal pride in what they have done, and continue to work on progressing and improving from there. They are often happy with their accomplishments but at the same time they never feel fully satisfied and always want to be better. For the INTJ showing a sense of pride is a good thing, but they don’t really need to show off. ENTJs do sometimes enjoy showing off a bit, especially when they are truly proud of something. They do want to see a positive response from their family and loved ones and are naturally social people. They don’t search for constant validation, but at the same time ENTJs do like to show off when they have accomplished something which took great effort and skill on their part. Since they work so hard on something they want to be able to take pride in it and show off a bit. INTPs don’t care to show off most of the time, since they don’t like exposing themselves or their accomplishments to others. They can have a hard time trusting people and might see this as a vulnerability that certain others can take advantage of. INTPs do like to show off when they have proven something wrong though, especially if that person has worked so hard to keep them down or hold them back. There are certain things they just can’t help but show off with, but most of the time they keep to themselves. ENTPs do enjoy showing off a bit, sometimes just for the fun of it and reading people’s reactions. They like to push the boundaries of others and of themselves, so sometimes it leads the ENTP to doing things just to see how it turns out. They do like to show off sometimes, and enjoy being able to have somewhat larger than life personalities. Sometimes they show off because they want to push buttons, other times it is because they sincerely are proud of their accomplishments. ISTJs don’t like to show off or be boastful when they have accomplished something. They often take pride in knowing what they have done, but often want to continue working towards even greater things. ISTJs can sometimes struggle to really pat themselves on the back, instead they continue to push harder and be better. They do enjoy when their loved ones show appreciate and a sense of pride in what they have done though and will certainly take this happily. ESTJs can certainly be show offs, since they enjoy receiving attention and praise for their accomplishments. They are more likely to show off in front of people they like or care deeply for. They want their family and loved ones to be proud of them and enjoy being able to see this on their faces. ESTJs are hardworking people who really push themselves to get things done efficiently, and because of this they do like showing off when they have accomplished something valuable. ISFJs don’t like showing off or making others feel uncomfortable around them. They would rather people show that they are proud of them without the ISFJ having to force this response. For the ISFJ showing off can be seen as rude and obnoxious and this isn’t something they enjoy being. They rarely show off, even though they do feel a sense of inner pride when they have accomplishing something successfully. They want their loved ones to be proud of them, but they don’t want to show off in order to have this happen. ESFJs don’t like showing off, but they do like sharing their accomplishments with the ones they love. They want to feel like the people close to them are really proud of their abilities and success. For the ESFJ showing off can be seen as rude and they don’t want to push people away by doing this. They often try to subtly share the things they have accomplished and show their abilities without having to force others to notice this. ISTPs really don’t care much about seeking approval, but that doesn’t mean they won’t show off sometimes. They enjoy being able to express their feelings about something and sometimes this means showing off a bit. When they are excited about an accomplishment they don’t want to feel like they have to restrain themselves or hold back for the sake of what someone else expects from them. ESTPs do like showing off, especially when they are around the people they care for most. They want these people to be proud of them and so they aren’t afraid of showing their accomplishments. When the ESTP is really proud and excited about something they have done, they will likely show off plenty and don’t really focus on how people might respond negatively to this. ISFPs do sometimes enjoy showing off when they are around the people they care for and trust. They can feel nervous doing this around strangers or new people, and don’t want to expose themselves that much. ISFPs can sometimes be self-conscious around those they do not trust, not wanting to be hurt by them. When they trust someone though, they do enjoy showing off a bit and want to be able to share what they are truly proud of. ESFPs do enjoy showing off and they often do this plenty in their lives. When they are proud of something they have accomplished the ESFP does not want to feel like they have to hold themselves back or hide their feelings. They enjoy showing off the things they are happy about, and rarely do they focus on how people respond to this. ESFPs want to be comfortable being proud of themselves and they want their loved ones too as well.